A seafood quiche recipe above and beyond! A knockout Seafood Quiche Recipe! Quiche is a favorite French food that’s both nutiritious and easy to bake. It makes a perfect breakfast dish, or even as a light lunch with salad or fresh bread rolls. This quiche recipe is unique because of its seafood ingredients - which usually aren’t featured in quiches at all. It’s for four people and will take us approximately an hour to prepare and bake. In a large deep frying pan you lightly saute the shallots with the fresh butter. Pour atop the dry white wine (Pinot Grigio) and let it almost completely evaportate in the pan, over a low flame. Wash very carefully the seafood under cool running water. Add the clams and mussels to the frying pan, keep stirring and set to a high flame. Stir just two or three times on a high flame. In about three minutes the shellfish will begin to open. Strain the shellfish from the pan, and keep the broth. You filter the broth through a filter and paper towel, to remove any sand remnants. A coffee filter also does the trick! Remove the meat from inside the shells (mussels and clams). Now we clean and cut the shrimp in smaller pieces. Place all the shellfish and the shrimp atop the pie crust dough. In a bowl, hit all the eggs with the heavy cream, finely cut parsley, salt, and fresh ground pepper. Also add a glass of the shellfish broth that you’ve saved. Pour the mixture atop of the shellfish in the pie crust, and bake at 400 degrees for just 30 to 35 minutes. 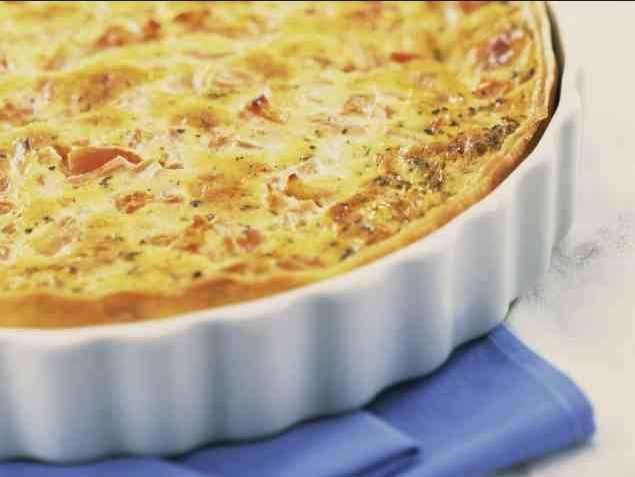 When the quiche is ready, remove it from the oven and let it cool down for ten minutes before cutting it into serving portions. What pairs well with our seafood quiche? Share with a light salad, and a glass of sparkling wine, like Spumante Secco.